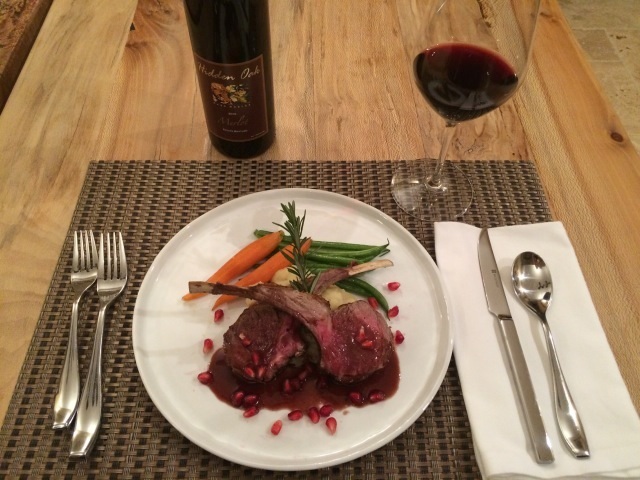 Sundance B&B Chef Alma teams with Mike James of Hidden Oak Winery, Paso Robles, for two delicious recipes for your holiday dinner…or anytime. 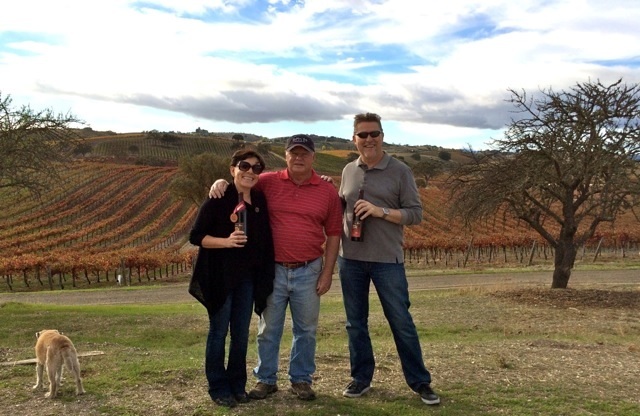 During the year and a half we were preparing Sundance Bed and Breakfast for its grand opening in Paso Robles, California, in July 2013, my husband Neil and I would try to visit two to four wineries each Sunday afternoon. Now that we live in Paso Robles, I thought, I’m going to try every varietal that’s grown here. I was not a big fan of Merlot, I must confess. When the movie Sideways came out, the line “I’m not drinking any f…ing Merlot” became a catch-phrase for me! But then we went to Hidden Oak Winery and their Estate Merlot was one of the wines on the tasting menu. I tried it. I loved it. And now here I am cooking with it! Recently we got together again with Mike James, the Owner and Winemaker at Hidden Oak, to discuss which wine he wanted to feature in the Back Roads food blog. 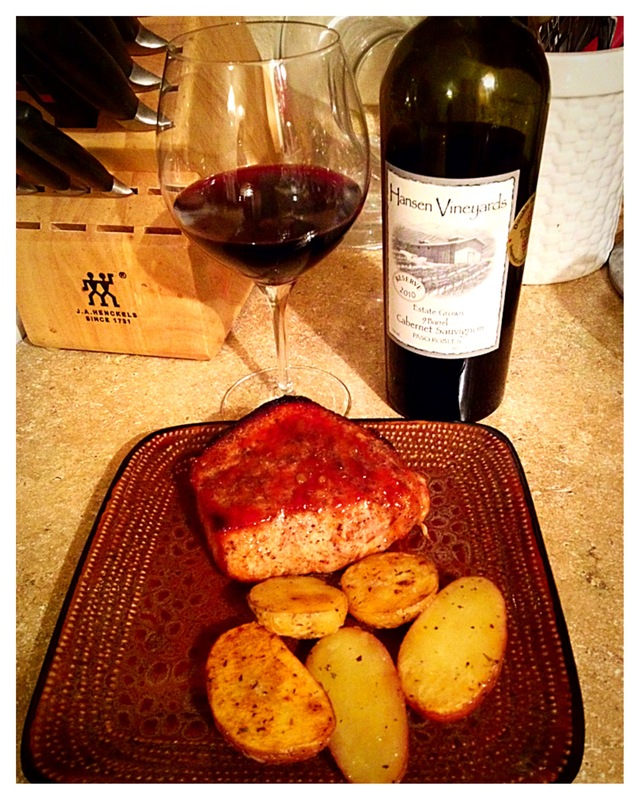 Petite Sirah was the one he chose. But his Merlot had changed my mind about Merlot and so it had a special place for me! 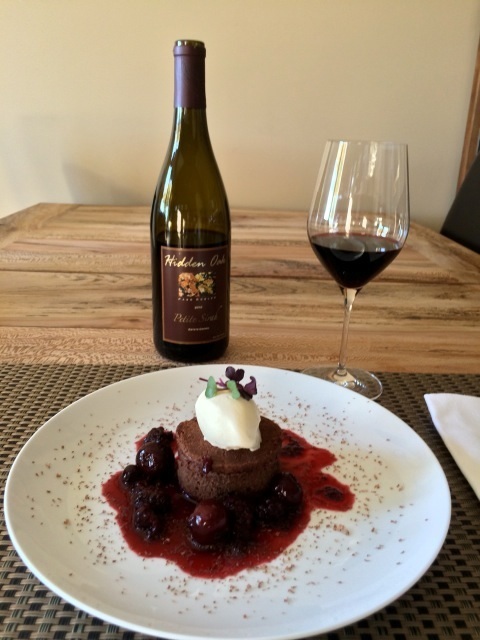 I suggested doing two recipes, one for each wine: Rack of Lamb with Pomegranate Merlot Sauce and Flourless Chocolate Cake with Petite Sirah Black Cherry-Berry Compote. I hope you enjoy making them as much as I enjoyed putting them together! The philosophy of winemaking at Hidden Oak Winery is a bit different. Mike specifically aims for the wines to be “ready to drink” as soon as the cork is popped. To achieve that, the wine must barrel age until ready. This could take 3, 4 or even 5 years before it is deemed ready for bottling. This method allows the wine to be much smoother and drinkable. 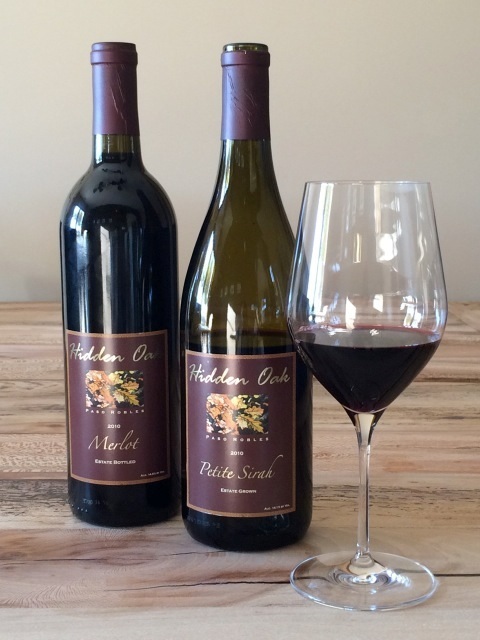 The Hidden Oak 2010 Merlot is 100% Estate grown. There’s a reason this wine is a perennial medal winner. The wonderful aromas of vanilla, black cherry and raspberry on the nose become well-balanced flavors on the palate. The soft tannins and long finish of this elegant wine ensure a pleasurable experience. Liberally season the rack of lamb with salt and pepper on both sides. Heat the olive oil in a 12-inch sauté pan over medium-high heat until very hot. Sear the rack of lamb until well browned on both sides, about 2 minutes per side. Transfer to a sheet and finish cooking in the oven until internal temperature reaches 125˚ for rare, and 135˚ for medium rare. Let rest for 5-10 minutes. In the meantime, pour off and discard all but about 1 or 2 Tbs. fat from the pan. Add the shallots to the pan and cook, stirring constantly, until browned, 1 to 2 minutes. Add the pomegranate juice, wine, chicken broth, vinegar, thyme, and honey and cook, stirring, until the liquid is reduced by half, 3 to 5 minutes. Reduce the heat to medium low and swirl in the butter until it melts. Taste and adjust the seasoning with salt and pepper. Sliced the rack into 8 chops and serve with mashed potatoes, sautéed French carrots and haricots verts (petite green beans). 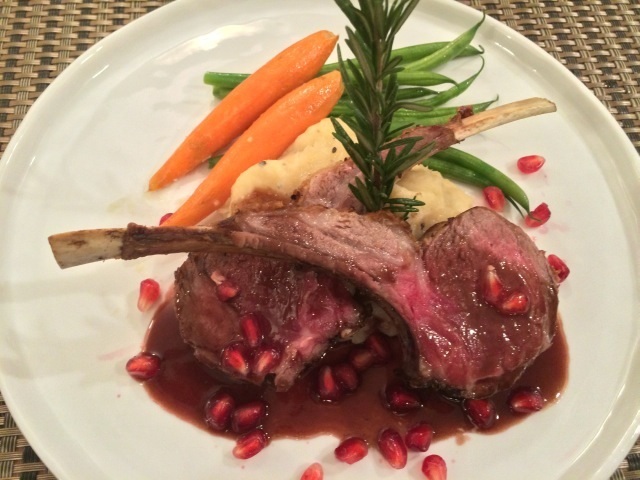 Drizzle some of the sauce on the chops and garnish with pomegranate seeds, if desired. Here is another award-winner from Hidden Oak! Check out the deep, rich color. This full-bodied wine is bursting with aromas of dark cherry, blackberries and cassis. The earthy spices envelop the flavors, adding layers of complexity. Velvety tannins swirl about on the palate to a long, sensuous finish, giving way to wisps of cocoa and vanilla. Place a six-mold mini cake pan (with removable bottoms) on a half sheet. Spray the inside of the molds with baking spray. Set aside. Combine chocolate and butter in a bowl. Place over a saucepan with simmering water and gently melt them together. In a separate bowl, whisk the egg yolks and 1½ ounces of sugar together until well combined. Whisk in the chocolate mixture and set aside. In a mixer bowl fitted with a whisk attachment, whisk egg whites until foamy. Drizzle in the remaining 1½ ounces of sugar and which on medium speed until all of the sugar is incorporated and the whites form soft, glossy peaks. Gently fold whites into the chocolate mixture. Pour into the mini molds and bake at 350˚ for about 15-20 minutes. When ready the cakes should start to crack on top, but still wobble in the center. Remove from the oven and let cool completely on a rack. Using a heavy bottom stainless steel pot on medium high heat, cook together defrosted berries, (including juices), petite sirah, and brown sugar until the mixture starts to bubble. Lower the flame to medium heat and continue to cook until a syrupy consistence is achieved, about 10-15 minutes, making sure the berries are still whole. Separate and cool 1/3 cup of the cooked berries and blend at high speed to puree. Strain the puree and add it to the cooked berry mixture. This will thicken and add more body to the sauce. Loosen the sides of the mini cakes with a pairing knife and push out from the bottom to remove each cake. Place cake in the center of a white place and spoon the compote around. Serve with vanilla ice cream. 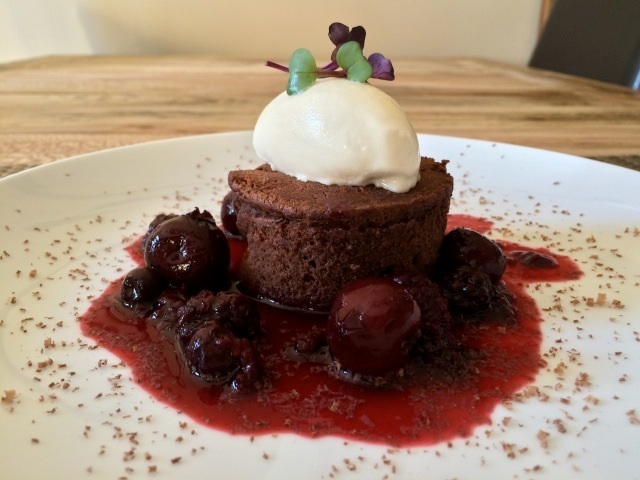 And please, do have a glass of the fabulous Hidden Oak Petite Sirah with this dessert. They are a perfect pair!